Skyscrapers are icons of architectural engineering. Also known as “supertall buildings” or “vertical cities,” skyscrapers represent a great example of human audacity by challenging the limits of nature. As the world population grows, humans have developed the need to start living among the clouds. And with this idea, there are great problems to be solved in order to build ever taller buildings. However, there are many details about skyscrapers that remain hidden for most people. It happens that when we began to build structures in the middle of the sky, not only were our lives affected, but also the rest of the world around us. In this list, let’s take a look at some of those effects and what skyscrapers could mean to us in the future. 10 How Tall Can A Building Get? To date, the tallest building in the world is the Burj Khalifa in Dubai, a skyscraper 830 meters (2,723 ft) tall. However, another building more than 1 kilometer (0.6 miles) tall called Jeddah Tower is being built in Saudi Arabia. At the same time, there are plans to build a skyscraper in Tokyo measuring 1,700 meters (5,577 ft) tall in the not-so-distant future. So we can ask ourselves, is there a height limit for the skyscrapers we can build? A simple answer is that at some point, skyscrapers cannot become taller. A building can have any height if its base is wide enough to support the structure. But due to the curvature of the Earth, both the base and the height of the building will have a limit. However, we are still far from reaching that limit. According to an engineer of the Burj Khalifa, we can build “higher than the highest mountain” in the world. This means that architectural engineering has no limitations when it comes to creating tall buildings. If problems such as the types of materials used, the shape of the structure, and climatic factors are solved, surely we can build them. 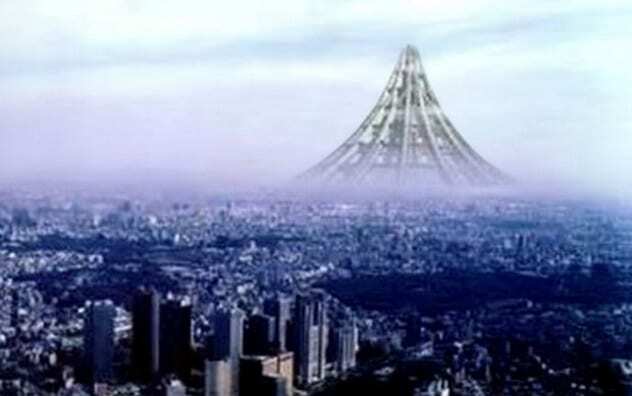 We can define the so-called “X-Seed 4000” (concept pictured above) as the tallest skyscraper we could build with our current technology. 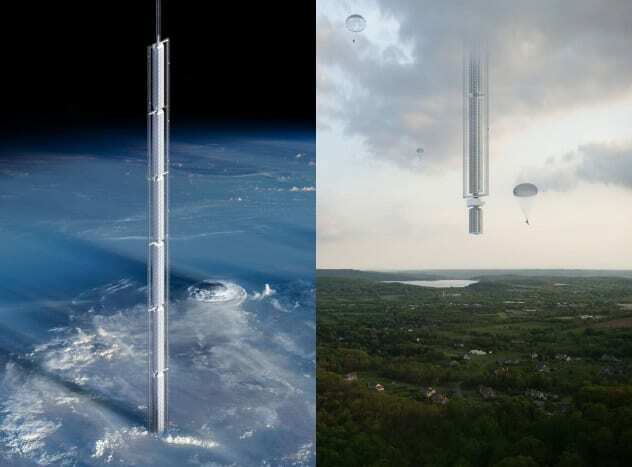 The X-Seed 4000 is a hypothetical skyscraper 4 kilometers (2.5 mi) tall and with a base 6 kilometers (3.7 mi) in diameter. Its mountain-shaped structure would have the capacity to house up to one million people inside. The blueprints for this building are complete, although it does not seem that the X-Seed 4000 is going to be built soon. The problem with this skyscraper is not the technology but its construction cost of $1.4 trillion, a sum that hardly any nation would be willing to pay. The term “skyscraper” was first used nearly a century and a half ago. However, claiming that there were no other skyscrapers before that date may denote a certain lack of knowledge about the architectural marvels that our ancestors achieved. For millennia, humans have been creating buildings capable of reaching the sky. A skyscraper is officially defined as a very tall building, capable of being continuously inhabited. The general rule around the world is that a skyscraper, regardless of its measurements, must stand out above the rest of the constructions of a city to be considered as such. Moreover, when the term started to be used in the late 19th century, buildings with more than ten floors were already skyscrapers. Later, other conditions were added to the concept: for example, that more than half the volume of a skyscraper must be habitable. So constructions like the pyramids do not have the title because they were tombs, both solid and uninhabitable. Our current communication and observation towers do not count, either. 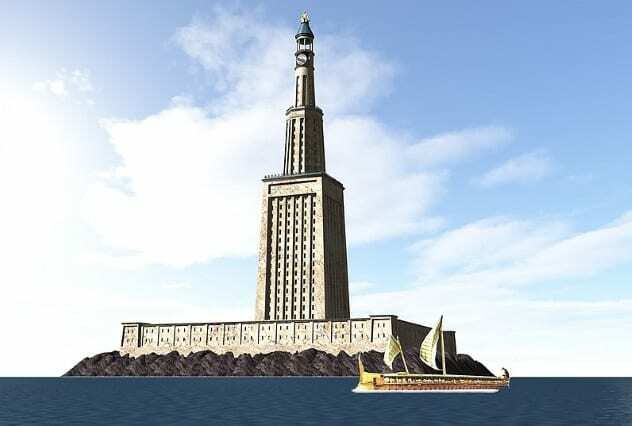 However, during the third century BC, the Ptolemaic dynasty built the so-called Lighthouse of Alexandria in Egypt. This building had a height of 135 meters (443 ft), and as its name indicates, it served as a guide for ships in the area. But beyond that, the lighthouse had 364 rooms inside and several galleries for tourists. So, obviously, this was an urban building and not just a tall tower. In AD 516, the Chinese built the Yongning Pagoda, a temple 137 meters (450 ft) tall. Although this building no longer exists today, some ancient descriptions showed it more like a palace, with around 1,000 rooms inside. So maybe we invented the term “skyscraper” recently, but scraping the sky with a building is not a new thing. Large buildings do not have to be built only on the Earth’s surface. They can also be built under the ground and therefore be called “Earthscrapers.” This type of building is exactly the opposite of conventional skyscrapers, since it is a structure that extends into the depths of the Earth. Its large size can house entire communities. Since Mexico City limits the height of new buildings in its historic center to a maximum of eight floors, the firm BNKR Arquitectura designed plans for an Earthscraper directly under the central square of the city. 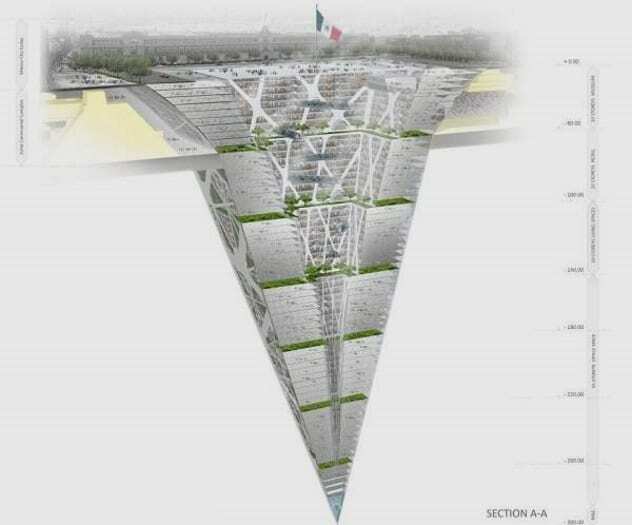 The underground building would be 65 stories deep, and its structure would resemble an inverted pyramid. The center of the building would be hollow to allow ventilation of the floors and parks beneath the surface. The highest part would be covered by a layer of glass, where the floor of the square used to be. In this way, the Earthscraper could interact with the rest of the city on the surface. Meanwhile, experts from Washington University in St. Louis have an idea to build an Earthscraper in Arizona’s abandoned Lavender Pit Mine. This underground skyscraper would extend through the 274-meter (900 ft) depth of the mine and would have everything from houses to work zones. The upper part of the Earthscraper would be sealed by a dome with skylights, which would blend in with the rest of the environment. It is well-known that urban populations modify the natural balance, erasing the fauna and flora that once inhabited the place to make way for modern artificial constructions. As humans, we do not usually adapt to the environment in which we live, but we adapt the environment to us. However, not only are the life-forms of the area affected by the emergence of large cities, but we also know that large buildings leave a big mark on the climate of the region. Skyscrapers modify the patterns of wind currents in the area. The effects will depend on the height where the wind current is located—at the base of the building, around it, or above it. Skyscrapers close to each other create “wind tunnels” that blow hard at ground level. Meanwhile, as the building acts as a wall, another part of the wind loaded with chemical pollutants rises into the atmosphere. These pollutants then travel to other regions or settle in areas around the building. In the latter case, the accumulation of pollutants due to skyscrapers can be highly harmful to the residents of a city. But the most interesting effect is the so-called “thermal effect.” Materials such as concrete or brick, used in buildings, are good at absorbing solar radiation. So during the day, the huge skyscraper absorbs the heat of the sunlight. Later, during the night, the skyscraper’s heat dissipates into the surrounding air, causing the temperature of the city to remain high. Then the Sun comes out again, and the effect is repeated, keeping the city always warmer than surrounding regions. Skyscrapers, earthscrapers—all of these are constructions made on dry land. But the ground is not the only place where a building can rest. In fact, we also have the idea of building skyscrapers on the water, the oceanscrapers. 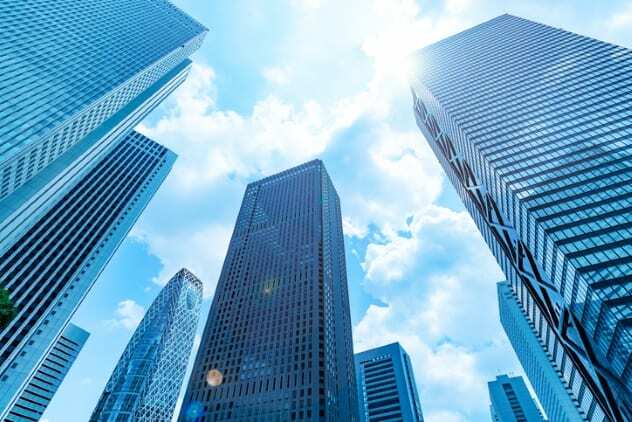 Although no oceanscraper has been built to date, the sea level is expected to rise considerably in the near future, so these buildings could become very useful. Many architectural projects involving oceanscrapers have been presented over time, but there is a recent one that stands out above the rest: the Aequorea. The Aequorea oceanscraper is a project created by architect Vincent Callebaut, who designed it to solve the problem of the trash accumulated in the oceans. According to the story he created about this structure, the existence of the Aequorea takes place in the year 2065. By then, humans collect plastics and other waste scattered in the sea and mix them with an algae emulsion, thus creating a malleable material in the form of filaments. Then, thanks to giant 3-D printers, oceanscrapers like the Aequorea are built with this material. 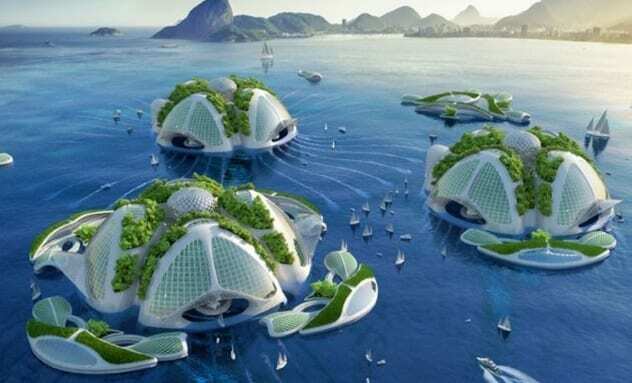 Yes, the oceanscrapers of the future will be made of ocean trash. The futuristic building would be 500 meters (1,640 ft) in diameter and stretch 1 kilometer (0.6 mi) deep, with a capacity for 20,000 people. Most of the structure would be underwater, like an iceberg, and would have giant tentacles that would keep it stable even in high-wind conditions. Hydroponic gardens cover the building, while food and other resources are obtained directly from the surroundings of the structure, making the Aequorea self-sufficient. It is a proven fact that tremors aren’t caused only by geological events, such as tectonic shifts. They can also be caused by large-scale human actions, such as mining or nuclear explosions. But what isn’t that common is an earthquake caused by a skyscraper, let alone two of them. Taipei 101 is a 508-meter-tall (1,667 ft) skyscraper located in Taiwan. 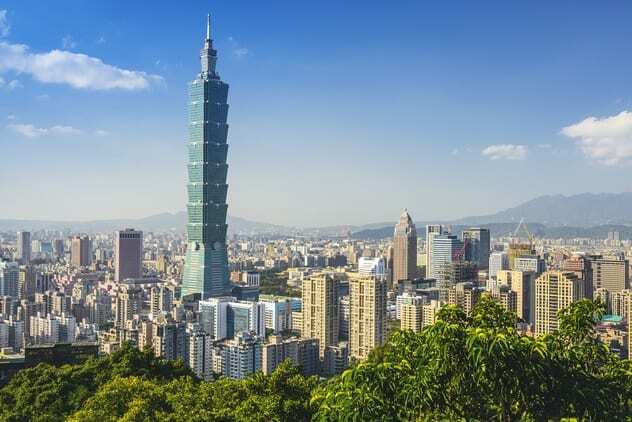 Before the completion of Taipei 101 in 2003, the area where the skyscraper was built was geologically quiet and free of noticeable earthquakes. But even during its construction, the amount of small tremors (called micro-earthquakes) tripled. Then, in 2004, an earthquake of magnitude 3.8 occurred just below Taipei 101. A few months later, another earthquake of magnitude 3.2 occurred at the same point under the building. It happens that to make Taipei 101 earthquake-proof, heavier materials were used. Therefore, the 700,000-ton mass of the building generates enormous pressure on the Earth’s crust below. Once the skyscraper was completed, this pressure spread across the area and triggered the earthquake. After these events, experts believe this should be a serious aspect to consider when designing taller buildings. After the previous points, we already know well that skyscrapers are not limited to ground level. Ironically, another type of “unconventional” skyscraper could be built directly in the sky, above the clouds. Although the idea may seem unlikely, the possibility of a floating skyscraper being built in the future is high. The Clouds Architecture Office, which has also worked on space transportation projects, has formulated a plan to create a floating building suspended from an asteroid in orbit. Relocating asteroids to make them orbit the Earth is not impossible. In fact, NASA once had plans for redirecting an asteroid (or at least a large chunk of one) in the 2020s. From that concept, the floating building would be tied to the asteroid, located 50,000 kilometers (31,068 mi) high, through high-resistance cables. The skyscraper, called Analemma Tower, would be formed by modules that could be gradually added to the structure. The tower would be powered by solar panels at the top, while it would get water directly from the clouds. If built, the lowest part of the building would be used for entertainment areas. Above would be the offices and residential areas, while the highest parts would even have a temple and a funerary section. At a maximum height of 32 kilometers (20 mi), the upper floors would have smaller windows, due to the pressure difference with the exterior. The finished building would be so large that the floors at the top would have 40 more minutes of sunlight than the lowest floors, due to the curvature of the Earth. Although the floating building would move over many countries, there is a possibility that the initial version of the skyscraper would be built in Dubai, due to lower construction costs than in other regions. Can a skyscraper become a destructive weapon? Unfortunately, yes, the design of a building can accidentally transform it into a microwave oven capable of inflicting serious damage to people. 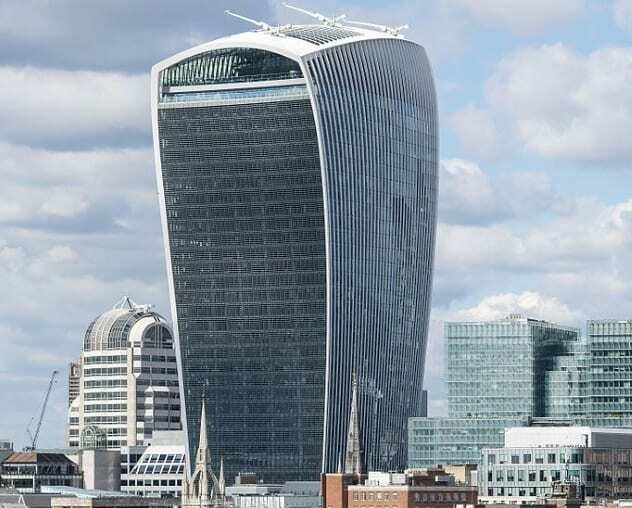 The “Walkie-Talkie” skyscraper in Central London has a curved, concave surface on one side. This means that when the sunlight reflects on that side, its windows concentrate the light into a narrow beam. To make it simple, it is like concentrating sunlight with a magnifying glass to burn ants. And the result is also equal to that of a magnifying glass, since anything in the path of the skyscraper’s beam is heated to temperatures as high as 117 degrees Celsius (243 °F). Indeed, in 2013, a car ended up with some of its parts completely melted by parking next to the Walkie-Talkie. Even a journalist was able to fry an egg under the “heat ray” of the building. A person standing in the light beam for a short time could end up with scorched hair. The skyscraper began to be referred to as the “Walkie Scorchie” or the “Fryscraper.” Fortunately, in 2014, the building was equipped with structures to dissipate the reflected light. So now pedestrians can be calmer when walking under the Walkie-Talkie. But this is not a unique case. The Vdara Hotel in Las Vegas, built by the same architects as the Walkie-Talkie, has the same design flaw, with windows that concentrate sunlight. In this case, the “death ray” was aimed directly at the pool area, so many tourists at the hotel suffered serious skin burns while in the water. In the end, the hotel company solved the problem by placing giant umbrellas above the pools. It took five years to build the Burj Khalifa. The construction of the Empire State Building took 20 months. For such vertical structures, these buildings were erected in a very short time. But that is not the best we can do. In China, a 57-story skyscraper was built in less than three weeks. The Chinese company Broad Sustainable Building built a skyscraper called Mini Sky City in just 19 days. The building, about 200 meters (656 ft) tall, used a revolutionary technique called modular construction. Since 90 percent of the skyscraper was prefabricated in a factory before proceeding with the construction, workers were able to assemble the building at a rate of three floors per day. 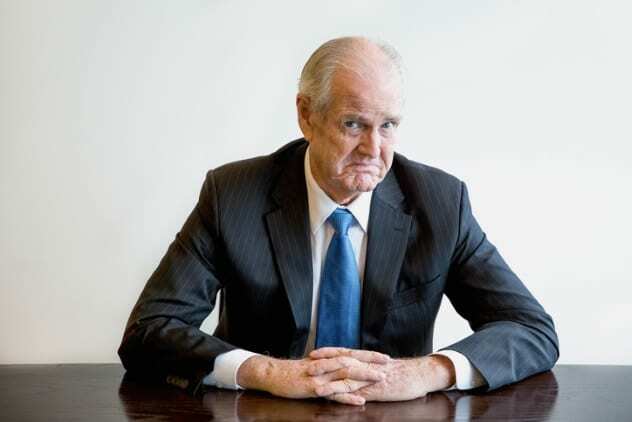 But this is not the first time the company has managed to establish a construction record. In 2011, it built a 30-story building in 15 days, using the same technique. If you wonder about the quality of this building, given the brevity of its construction, the structure is designed to withstand earthquakes of magnitude 9.0. The founder of the Chinese company also plans to build a giant skyscraper called Sky City, with a height of 220 stories, which would end up being taller than the Burj Khalifa. Its construction time, he says, would be only seven months. To build skyscrapers, the modular construction technique is gradually being accepted in the rest of the world, which means that in a few years, we could see LEGO-like buildings anywhere. So skyscrapers affect the weather and the environment, but what about us? Does a person living in a skyscraper suffer any effect? As a matter of fact, yes, a person ages faster by living on top of a building. This happens due to an extraordinary physical phenomenon called gravitational time dilation. Because of this phenomenon, when we move away from an object with great mass, like the Earth, time goes faster for us. But how fast would we age up there? In the second half of the 20th century, a project called Temps Atomique International was launched. Atomic clocks were placed in different regions of the world, at different heights, to measure global time accurately. In the 1970s, it was concluded that at a height of 30 meters (100 ft), time goes one picosecond (one trillionth of a second) faster than at sea level. Now let’s suppose that the average life expectancy of a person is 70 years. If we do the math, at 30 meters (100 ft) high, a person will have aged two milliseconds faster by the end of his life. In 1976, the SAO Institute in Cambridge launched a rocket carrying a clock to a height of 9,656 kilometers (6,000 mi). When the clock returned to Earth and was analyzed, it was observed that time at that height moves one second faster every 70 years. Evidently, the same would apply to a person. So what does this mean in simple words? Well, a person who lives all his life in a skyscraper would age a few seconds faster than a person at ground level. Of course, this age difference between both people will not be noticeable. But we have already seen that skyscrapers have almost no height limit, and as they will be built taller in the future, the age gap will become larger. So be careful: Now you know that spending a lot of time in a building is bad for your health. Read about more amazing buildings on 10 Of The Most Stunning And Unique Buildings In The US and Top 10 Abandoned Skyscrapers From Around The World.